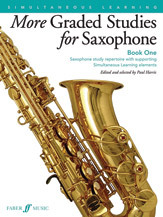 More Graded Studies for Saxophone, Book One brings together saxophone study repertoire spanning the entire spectrum of technique and provide a firm foundation for progress. Featuring core studies alongside specially composed pieces by Paul Harris, these comprehensive collections apply the Simultaneous Learning approach to instrumental technique. Book 1 begins at the elementary level and progresses to intermediate (approx. grades 1--5). The studies are arranged in order of increasing difficulty, according to a carefully planned technical progression, and each study comes with a list of Simultaneous Learning musical ingredients for players to explore in preparation for the music.